The ‘1944 Eagle and Snakes’ Stamp of Nazi Germany was issued to commemorate the 21st Anniversary of the Beer Hall Putsch. Also known as the Munich Putsch, the Beer Hall Putsch was a failed attempt by the Nazi Party to seize power in Munich, Bavaria. This coup d’etat took place on 8-9 November 1923. Approximately two thousand Nazis were marching to the Feldherrnhalle, in the city center, when they were confronted by the police. As a result, 16 Nazis dies and Hitler was arrested. This failed attempt became the turning point of Germany as after the release of Hitler he slowly rose to the position of Furor and the rest is known. This important event of German Reich history turned 21 in Nov 1944. To commemorate this earliest coup guided of Hitler, an exceptional stamp was issued on 9th Nov 1944. The stamp is a beautiful white and red stamp with the denomination of 12 marks along with the surtax of 8 marks. 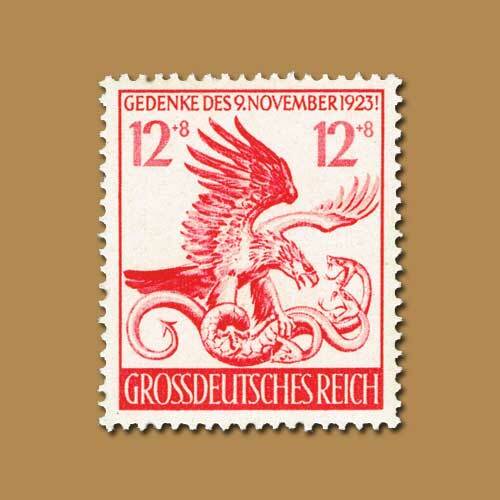 The stamp design is interesting in that it shows an eagle (Germany) fighting a 3 headed serpent, the heads possibly representing Britain, France and the United States all co-signatories of the most hated Versailles Treaty concluded at the end of the First World War and arguably one of the underlying causes of the Second World War.